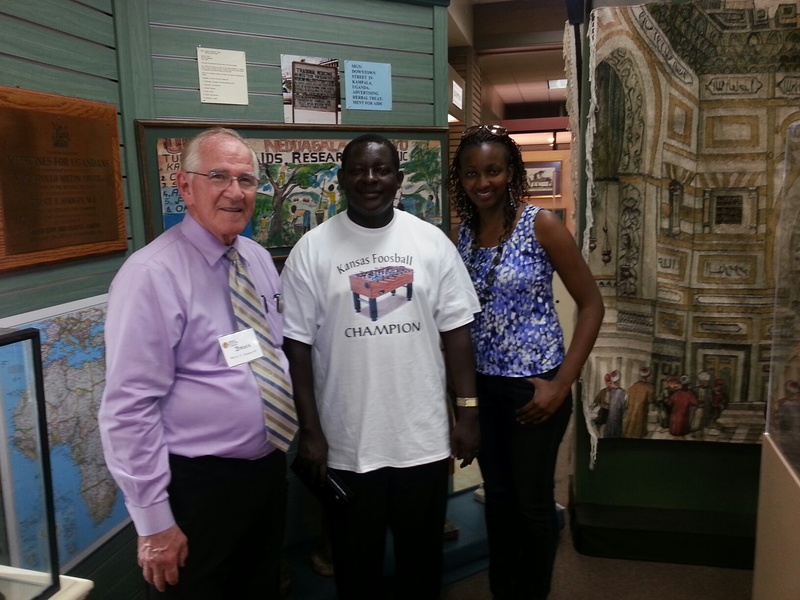 Fellow Rotarian Charley Vogt shares his six day experience as an East African Group Study Exchange (GSE) Team host. Charley, wife Val and daughter Kelly hosted a doctor from Kenya “Jacob” who was part of a five member medical team from East Africa. See the outline of doctors, where they are from, the GSE Home Hosts and the GSE 2013 Month Itinerary. “The team lived with eight different families while they were here. As they toured our district, a USA team led by Shawnee Rotarian Dr. Rick Randolph led a team of doctors and nurses to east Africa as part of the medical team exchange. At a party hosted by District Governor Kevin Tubbesing in Shawnee, both teams converged for the first time since they met at an East Africa District 5002 conference in early May. Our favorite hosting stories revolved around eating. East Africans eat their fish fried or poached. We eat ours grilled at home. I taught our guest how to cook salmon and vegetables on the grill. For breakfast, we like to make banana nut pancakes. Our guest had eaten pancakes, banana’s (11 varieties in Africa) and nuts, but never all together. Taking them off the grill, he rolled them up like a hot dog, placed them in a napkin, and ate them like eating an ice cream on a stick. Tried the plate with maple syrup, but went back to the roll up the next morning. Another favorite story involved Foosball. We have a Foosball board in our rec room basement, and we introduced our East African guests to the game, which many had not played before. After more than two hours of playing (and hooting as goals were scored) non-stop, they declared Jacob the Kansas Foosball Champion. I worked with a local T-shirt vendor and had a shirt made with that inscription. All three of us loved the hosting experience and would not have traded it for the world. 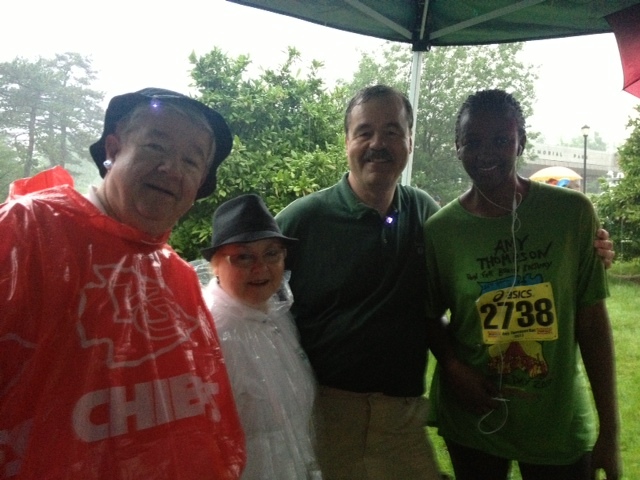 Dr. Elizabeth even ran the 8K Amy Thompson run on Memorial Day Monday morning in the pouring rain and was pleased to be a part of a benefit for the brain injury association of greater KC. If interested in helping with this initiative or serving as a Group Study Exchange Host, please contact Charley Vogt for more information. This entry was posted in Rotary Programs and tagged Bonner Springs Rotary Club, Rotary Group Study Exchange on June 10, 2013 by Bonner Springs Rotary Club.